Tampa-based ultra-premium Touch Vodka will be a sponsor for the NO Pain NO Gain 8 - Riverwalk Brawl held at the Tampa Convention Center this Saturday, May 20th starting at 7:30 p.m. Among those scheduled to compete are Evander Lance Lamourt, Martin El Gallito Lagunas, Fernando Martinez, James JT Taylor, King Kenmon Evans, Victor Kulakovskyi, and Paulie Simpson. Crafted and distilled by Fat Dog Spirits in Tampa, Touch Vodka is the only vodka in the world distilled using as part of its formularies pure organic honey from the Florida Everglades. When Touch was first launched developers wanted to make a craft spirit unique to Florida using locally sourced ingredients. Florida blended grapefruits, key limes, and Valencia oranges flavors were later added because of their significant presence in Florida. 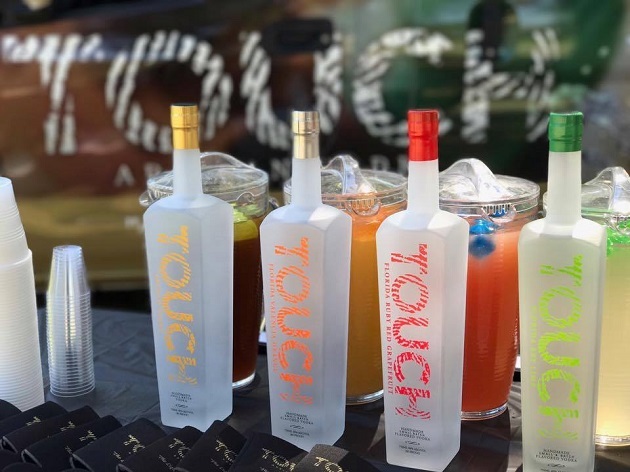 Touch Vodka features three citrus infused selections – Key Lime, Valencia Orange and Ruby Red Grapefruit. Tickets for the event are through individual fighters or through Borincuba Plaza. Touch Vodka can be found locally at Tampa area bars and nightclubs including Tequilas in Ybor City and SCORES Gentlemen's Club and Steakhouse, and upscale restaurants like Malio's Prime Steakhouse and Jackson's Bistro Bar. A complete listing of where you can find Touch Vodka can be found on their site. For more fun things to do in Tampa check out our complete guide to Events in Tampa.